Inside a narrow glass tube sits a substance that can harm or cure, depending on how you use it. It gives off a faint blue glow, a sign of its radioactivity. While the energy and subatomic particles it emits can damage human cells, they can also kill some of our most stubborn cancers. This substance is actinium-225. Fortunately, scientists have figured out how to harness actinium-225's power for good. They can attach it to molecules that can home in on only cancer cells. In clinical trials treating late-stage prostate cancer patients, actinium-225 wiped out the cancer in three treatments. "There is no residual impact of the prostate cancer. It's remarkable," said Kevin John, a researcher at the Department of Energy's (DOE) Los Alamos National Laboratory (LANL). Actinium-225 and treatments derived from it have also been used in early trials for leukemia, melanoma, and glioma. But something stood in the way of expanding this treatment. For decades, one place in the world has produced the majority of actinium-225: DOE's Oak Ridge National Laboratory (ORNL). Even with two other international facilities contributing smaller amounts, all three combined can only create enough actinium-225 to treat fewer than 100 patients annually. That's not enough to run anything but the most preliminary of clinical trials. To fulfill its mission of producing isotopes that are in short supply, the DOE Office of Science's Isotope Program is leading efforts to find new ways to produce actinium-225. Through the DOE Isotope Program's Tri-Lab Research Effort to Provide Accelerator-Produced 225Ac for Radiotherapy project, ORNL, LANL, and DOE's Brookhaven National Laboratory (BNL) have developed a new, extremely promising process for producing this isotope. Producing isotopes for medical and other research is nothing new for DOE. The Isotope Program's origins date back to 1946, as part of President Truman's effort to develop peaceful applications of atomic energy. Since then, the Atomic Energy Commission (DOE's predecessor) and DOE have been manufacturing isotopes for research and industrial uses. The unique challenges that come with isotope production make DOE well-suited for this task. Isotopes are different forms of the standard atomic elements. While all forms of an element have the same number of protons, isotopes vary in their number of neutrons. Some isotopes are stable, but most are not. Unstable isotopes are constantly decaying, emitting subatomic particles as radioactivity. As they release particles, isotopes change into different isotopes or even different elements. The complexity of producing and handling these radioactive isotopes requires expertise and specialty equipment. The DOE Isotope Program focuses on manufacturing and distributing isotopes that are in short supply and high demand, maintaining the infrastructure to do so, and conducting research to produce isotopes. It manufactures isotopes that private companies are not making commercially available. Producing actinium-225 brings the national laboratories' expertise into a new realm. Actinium-225 has such promise because it's an alpha emitter. Alpha emitters discharge alpha particles, which are two protons and two neutrons bound together. As alpha particles leave an atom, they deposit energy along their short path. This energy is so high that it can break bonds in DNA. This damage can destroy cancer cells' ability to repair and multiply, even killing off tumors. "Alpha emitters can work in cases where nothing else works," said Ekaterina (Kate) Dadachova, a researcher at University of Saskatchewan College of Pharmacy and Nutrition who tested the actinium-225 produced by DOE. However, without a way to target cancer cells, alpha emitters would be just as harmful to healthy cells. Scientists attach alpha emitters to a protein or antibody that exactly matches the receptors on cancer cells, like fitting a lock into a key. As a result, the alpha emitter only accumulates on the cancer cells, where it emits its destructive particles over a very short distance. "If the molecule is designed correctly and goes to the target itself, you kill only the cells that are around the targeted cell. You do not kill the cells that are healthy," said Saed Mirzadeh, an ORNL researcher who began the initial effort to produce actinium-225 at ORNL. Actinium-225 is unique among alpha emitters because it only has a 10-day half-life. (An isotope's half-life is the amount of time it takes to decay to half of its original amount.) In fewer than two weeks, half of its atoms have turned into different isotopes. Neither too long nor too short, 10 days is just right for some cancer treatments. The relatively short half-life limits how much it accumulates in people's bodies. At the same time, it gives doctors enough time to prepare, administer, and wait for the drug to reach the cancer cells in patients' bodies before it acts. 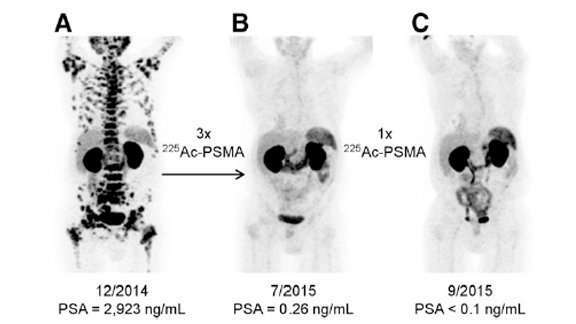 While it took decades for medical researchers to figure out the chemistry of targeting cancer with actinium-225, the supply itself now holds research back. In 2013, the federal Food and Drug Administration (FDA) approved the first drug based on alpha emitters. If the FDA approves multiple drugs based on actinium-225 and its daughter isotope, bismuth-213, demand for actinium-225 could rise to more than 50,000 millicuries (mCi, a unit of measurement for radioactive isotopes) a year. The current process can only create two to four percent of that amount annually. Part of this scarcity is because actinium is remarkably rare. Actinium-225 does not occur naturally at all. Scientists only know about actinium-225's exceptional properties because of a quirk of history. In the 1960s, scientists at the DOE's Hanford Site produced uranium-233 as a fuel for nuclear weapons and reactors. They shipped some of the uranium-233 production targets to ORNL for processing. Those targets also contained thorium-229, which decays into actinium-225. In 1994, a team from ORNL led by Mirzadeh started extracting thorium-229 from the target material. They eventually established a thorium "cow," from which they could regularly "milk" actinium-225. In August 1997, they made their first shipment of actinium-225 to the National Cancer Institute. Currently, scientists at ORNL "milk" the thorium-229 cow six to eight times a year. They use a technique that separates out ions based on their charges. Unfortunately, the small amount of thorium-229 limits how much actinium-225 scientists can produce. Ultimately, the Tri-Lab project team needed to look beyond ORNL's radioactive cow to produce more of this luminous substance. "The route that looked the most promising was using high-energy accelerators to irradiate natural thorium," said Cathy Cutler, the director of BNL's medical isotope research and production program. Only a few accelerators in the country create high enough energy proton beams to generate actinium-225. BNL's Linear Accelerator and LANL's Neutron Science Center are two of them. While both mainly focus on other nuclear research, they create plenty of excess protons for producing isotopes. The new actinium-225 production process starts with a target made of thorium that's the size of a hockey puck. Scientists place the target in the path of their beam, which shoots protons at about 40 percent the speed of light. As the protons from the beam hit thorium nuclei, they raise the energy of the protons and neutrons in the nuclei. The protons and neutrons that gain enough kinetic energy escape the thorium atom. In addition, some of the excited nuclei split in half. The process of expelling protons and neutrons as well as splitting transforms the thorium atoms into hundreds of different isotopes – of which actinium-225 is one. After 10 days of proton bombardment, scientists remove the target. They let the target rest so that the short-lived radioisotopes can decay, reducing radioactivity. They then remove it from its initial packaging, analyze it, and repackage it for shipping. Then it's off to ORNL. Scientists there receive the targets in special containers and transfer them to a "hot cell" that allows them to work with highly radioactive materials. They separate actinium-225 from the other materials using a similar technique to the one they use to produce "milk" from their thorium cow. They determine which isotopes are in the final product by measuring the isotopes' radioactivity and masses. Figuring out this new process was far from easy. First, the team had to ensure the target would hold up under the barrage of protons. The beams are so strong they can melt thorium – which has a melting point above 3,000 degrees F. Scientists also wanted to make it as easy as possible to separate the actinium-225 from the target later on. "There's a lot of work that goes into designing that target. It's really not a simple task at all," said Cutler. Next, the Tri-Lab team needed to set the beamlines to the right parameters. The amount of energy in the beam determines which isotopes it produces. By modeling the process and then conducting trial-and-error tests, they determined settings that would produce as much actinium-225 as possible. But only time and testing could resolve the biggest challenge. While sorting actinium out from the soup of other isotopes was difficult, the ORNL team could do it using fairly standard chemical practices. What they can't do is separate out the actinium-225 from its longer-lived counterpart actinium-227. When the team ships the final product to customers, it has about 0.3 percent actinium-227. With a half-life of years rather than days, it could potentially remain in patients' bodies and cause damage for far longer than actinium-225 does. To understand the consequences of the actinium-227 contamination, the Tri-Lab team collaborated with medical researchers, including Dadachova, to test the final product. After analyzing the material for purity and testing it on mice, the researchers found no significant differences between the actinium-225 produced using the ORNL and the accelerator method. The amount of actinium-227 was so miniscule that it "doesn't make any difference," said Dadachova. Having resolved many of the biggest issues, the Tri-Lab project team is in the midst of working out the new process's details. They estimate they can provide more than 20 times as much actinium-225 to medical researchers as they were able to originally. Those researchers are now investigating what dosages would maximize effectiveness while minimizing the drug's toxicity. At the same time, the national labs are pursuing upgrades to expand production to the level needed for a commercial drug. They're also working to make the entire process more efficient. "Having a larger supply from the DOE is essential to expanding the trials to more and more centers," said Scheinberg. With the Tri-Lab project ahead of schedule, it appears that the new production process for actinium-225 could lead to a better ending for more patients than ever before.